The large full color display and intuitive programming give you access to all your programmable criteria on a single screen - eliminating scrolling through menus and supporting error-free operation. The AS950 is the only sampler that utilizes a USB drive to upload and download data and copy programs from one sampler to another. The program status screen instantly communicates alarms, missed samples and program progress for quick and easy troubleshooting. Weighing only 28 pounds (12.7 kg), the AS950 Portable Sampler is designed for accuracy and convenience. Quickly switch between composite and discrete sampling in the field. 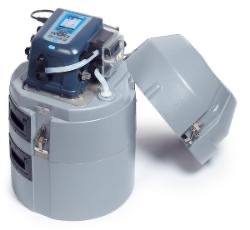 Configurable for single- or multiple-bottle applications, it is specifically designed for use in 18- inch manholes. The rugged see-through pump cover is made for a quick visual inspection. Desiccant and pump tubing can easily be accessed; the replacement is possible without any tools. Together with the long pump tubing life, this keeps maintenance costs low. Alarm: Configurable alarms that show on status screen and are recorded in diagnostics alarm logs. Alarms can be set for system diagnostics and logging such as program end, sample complete, missed samples and full bottle. Channel alarms are setpoint alarms for the recorded measurements (channels), such as pH, level and power supply voltage. Communication Capabilities: USB and optional RS485 (Modbus). Data Logger: SAMPLE HISTORY - Stores up to 4000 entries for sample time stamp, bottle number and sample status (success, bottle full, rinse error, user abort, distributor error, pump fault, purge fail, sample timeout, power fail and low main battery). MEASUREMENTS - Stores up to 325,000 entries for selected measurement channels in accordance with the selected logging interval. EVENTS - Ability to store up to 2000 entries in Sample History logging. Records Power On, Power Fail, Firmware Updated, Pump Fault, Distributor Arm Error, Low Memory Battery, Low Main Battery, User On, User Off, Program Started, Program Resumed, Program Halted, Program Completed, Grab Sample, Tube Change Required, Sensor Communication Errors, Cooling Failed, Heating Failed, Thermal Error Corrected. Diagnostics: View event and alarm logs as well as maintenance diagnostics. Display: 1/4 VGA, Color; self-prompting/menu-driven program. Display Lock Function: Access code protection prevents tampering. Factory Installed Options: TWO SENSOR PORTS. Accepts Hach digital Differential pH, Hach digital AV9000 analyzer with submerged area velocity flow and/or Hach digital US9000 ultrasonic level sensors. Programs: Dual Programs: Up to 2 sample programs can be run sequentially, in parallel, or according to day of week scheduling; enabling a single sampler to function like multiple samplers. Pump flow rate: 4.8 L/min (1.25 gpm) at 1 m (3 ft) vertical lift with 3/8-in intake tube typical. Sample Container: 1 - 2.5 Gallon. Sample Interval: Selectable in single increments from 1 to 9,999 flow pulses or 1 to 9,999 mins in one minute increments. Sample Transport Velocity: 2.9 ft/s (0.9 m/s) with 15 ft (4.6 m) vertical lift, 16 ft of 3/8-in. vinyl intake tubing, 70°F (21°C) and 5000 ft elevation. Sample Trigger: When equipped with flow sensor or pH/temperature sensor or peripheral monitoring options, sampling can be triggered upon an upset condition when field selectable limits are exceeded. Sample Volume: Programmable in 10-mL (0.34 oz) increments from 10 to 10,000 mL (3.38 oz to 2.6 gal). Sample Volume Accuracy: Typical: ±5% of 200 mL sample volume with: 4.6 m (15 ft) vertical lift, 4.9 m (16 ft) of 3/8- in. vinyl intake tube, single bottle, full bottle shut-off at room temperature and 1524 m (5000 ft) elevation. Sample Volume Repeatability: Typical: ±5% of 200 mL sample volume with: 4.6 m (15 ft) vertical lift, 4.9 m (16 ft) of 3/8- in vinyl intake tube, single bottle, full bottle shut-off at room temperature and 1524 m (5000 ft) elevation. Status Messages: Communicates what program is running, if there are any missed samples, when the next sample will be taken, how many samples remain, number of logged channels, time of last measurement, memory available, number of active channels, if alarms were triggered, when alarms were triggered, active sensors and cabinet temperature. Suction Hose Outer Diameter: 1/4" and 3/8" ID Teflon-lined Polyethylene with protective outer cover available in clear and black. Temperature: Operating: 0 to 49 °C (32 - 120 °F) Storage: -40 to 60 °C (-40 to 140 °F). Tubing: Pump tubing: 9.5 mm ID x 15.9 mm OD Silicone. Intake tubing: 1.0 - 4.75 m minimum length, 1/4" or 3/8" ID Vinyl or 3/8" ID Teflon-lined Polyethylene with protective outer cover (black or clear). User Interface: Membrane switch keypad with 2 multiple function soft keys. 1 ea. AS950 controller on compact portable base1 ea. 115V power supply (8754500US)1 ea. Bottle kit (PC010030) includes 2.5 gallon polyethylene bottle w/cap (1918) and full bottle shut-off (8996)1 ea. 25' vinyl intake tubing (926)1 ea. strainer (926).